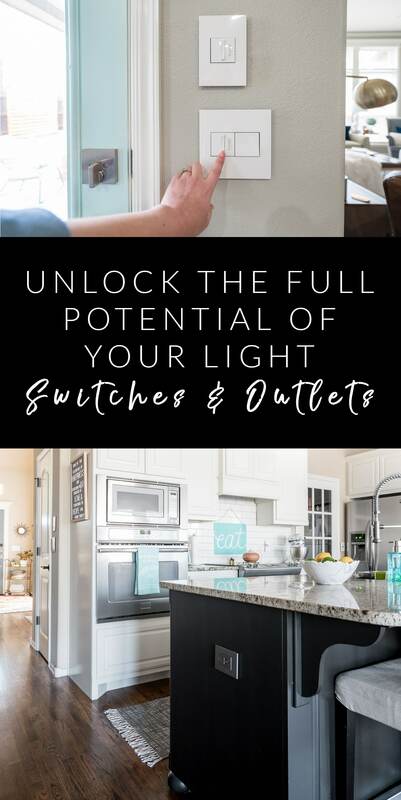 Beautiful light switches and outlets can be the finishing touch your home needs! 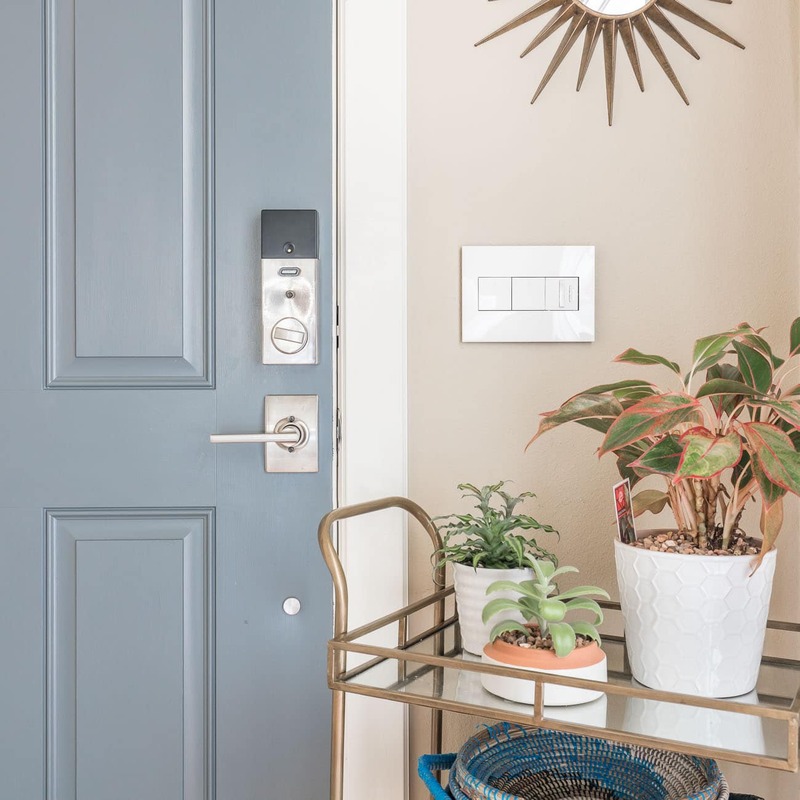 The Legrand adorne® collection brings both style and function to our home with everything from basic switches and pop out outlets to Alexa integration. You know how the perfect statement jewelry can take your outfit from okay to fabulous? I found the equivalent accessory that took our house to the next level! But true to our mission of making homes more functional AND beautiful at the same time, this “jewelry” has a purpose. 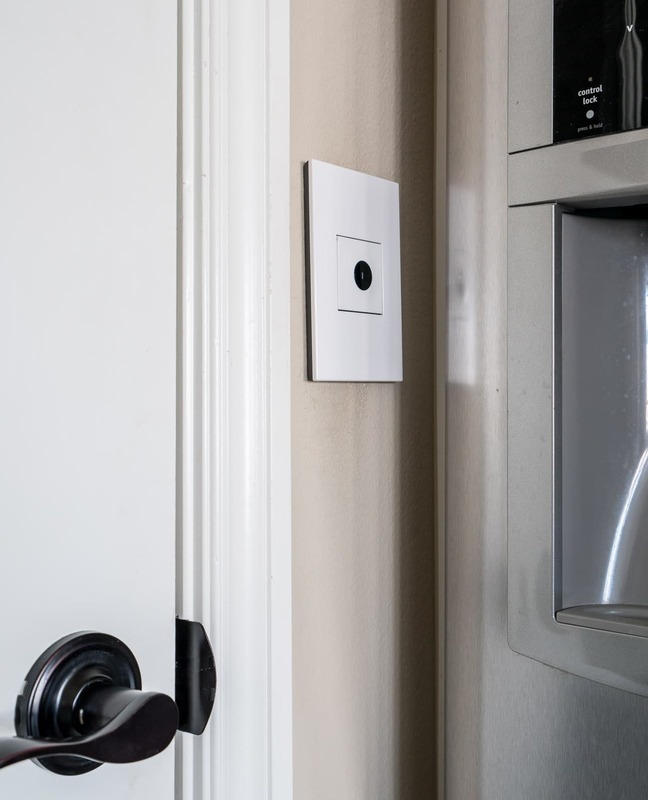 I worked with Legrand to swap out the light switches and outlets in the public areas of our house over the last few months, and it didn’t take me long to wonder why we didn’t know about this option when we built our home. When they originally contacted me to work together, I didn’t understand how I could rationalize the time and money to change out light switches that I thought looked and worked fine. 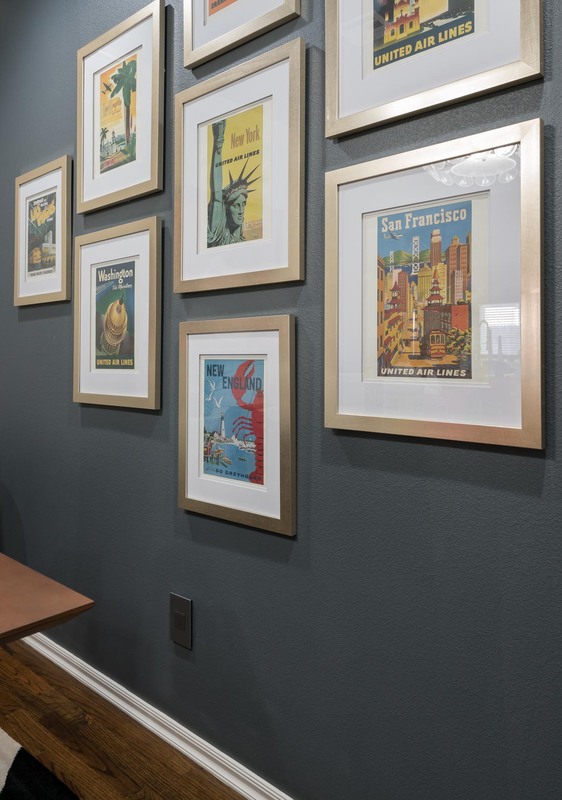 After browsing their website and seeing the familiar phrase “improve the look and function of your home,” I was intrigued. Anyone using a tagline that similar to mine was definitely worth considering. I’m beyond happy I noticed because this project absolutely made our home work better AND look better! Check out this quick video we made of our favorites and then you can see all the details and normal photos below that. 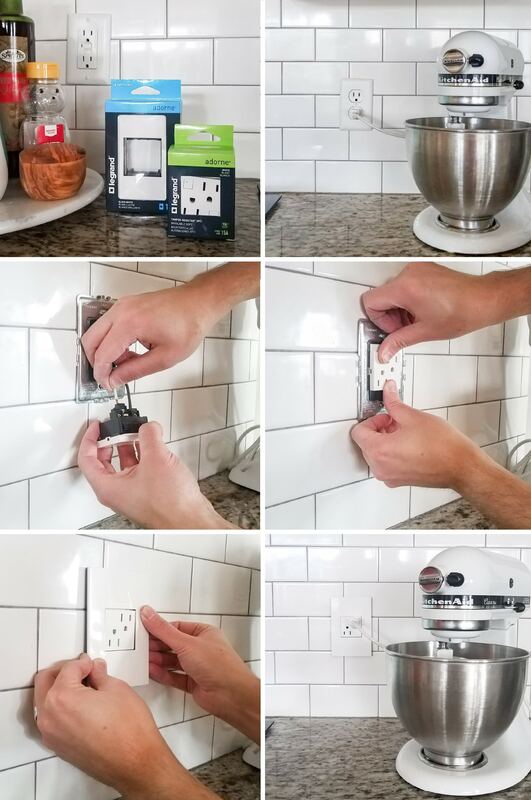 For each outlet or switch, you’ll need a wall plate (the style), the actual guts (the function), and a screwdriver. No other tools are needed! 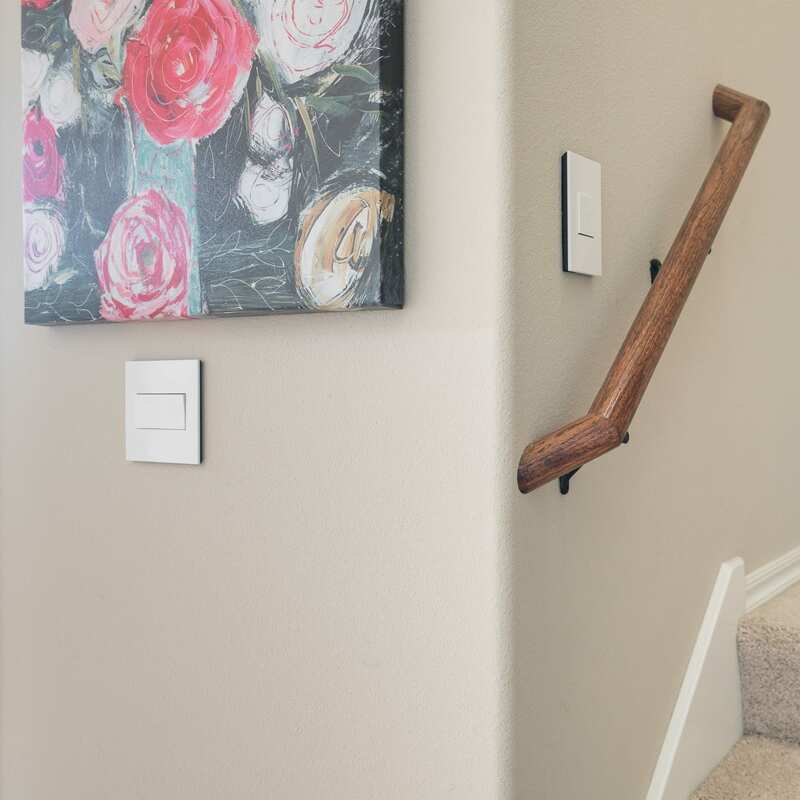 The wall plates are sleek with no visible screws and will instantly elevate the look of your home. I used either gloss white or titanium throughout our house, but they have really cool options including leather, wood, metal, and even a paintable model! Since we used a wide variety of products from top to bottom of the pricing and function scale, I broke them down into three categories for you. The base models from the adorne® line are the Paddle Switches and Standard Outlets. Although I’m referring to these as basic, that’s basic-level pricing and ease of installation, but the look is anything but basic. If you’re comfortable changing out a light fixture, you can DIY these. Just follow all the normal safety precautions and triple check that the breaker is turned off. Legrand has a library of installation videos where you can get all the details! I also put together an image showing how easy the process is below. I underestimated how much more I would like the affordable paddle style switches compared to traditional light switches. This category is where the function really begins to shine. These options were also easy installs, but the price is a bit higher to account for the magic they provide. One of my absolute favorites is the Wave sensor we installed for our pantry. The old light switch and the wall around it was always getting dirty, and the switch itself was awkwardly placed half-behind the fridge. Now, we have a sensor that just needs something waved in front of it to trigger the light. It could be your hand, or it could be something you are carrying. Since I’m generally carrying things in and out of the pantry, it’s amazing. You’d be surprised how fast it becomes 2nd nature to just fling a bag of chips in front of the sensor without pausing your walk. The other spot I’m frequently carrying things is up the stairs. We thought about a Wave sensor here, but I didn’t want it triggering during the day, so we went with a sofTap model. It’s a large push button that works just as well with an elbow while you’re carrying laundry as it does with your hand, as you saw in the video! Another functional enhancement you can add to any of these switches (or outlets) is an accent nightlight. They light up from below the switch as you can see below in the picture of our hallway. I no longer have to grab my phone to use it as a flashlight if I need water in the middle of the night! The light switches aren’t the only stars in this section though! We have outlets in the ends of our island, and there is a constant rotation of chargers plugged into them. Most of them are USB chargers, but then we mix in laptop and camera chargers. Two plugins just aren’t enough, so we switched them out to the Plus-Size Combo USB outlets. Now we have two USB outlets and two standard outlets per side. The arrangement is especially great when we are entertaining because I can’t even count the number of times people bring in USB cords to charge phones while they are here. 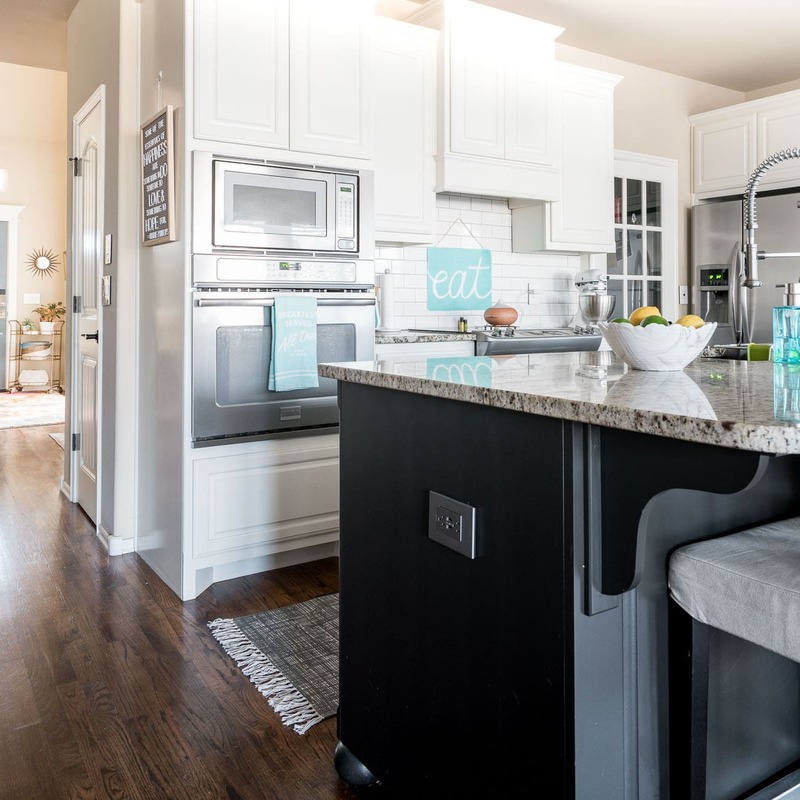 You may have noticed we went with the Titanium color for those outlets so they would blend it better with the dark island. We also went with Titanium on the dark wall of the dining room, but got even fancier here. It’s very rare that we would use the outlet on the back wall, but we still wanted it to be functional if needed. To streamline the look, we opted for a pop-out outlet. Most of the time it just blends right into the wall. But if I tap it, the outlets pop right out. In the video, we featured this along with the other amazing pop out option – the portable nightlight. It’s clearly a more streamlined look that a traditional plug-in nightlight, but it also has secrets. First, in a power outage, it will still be shining brightly for us. 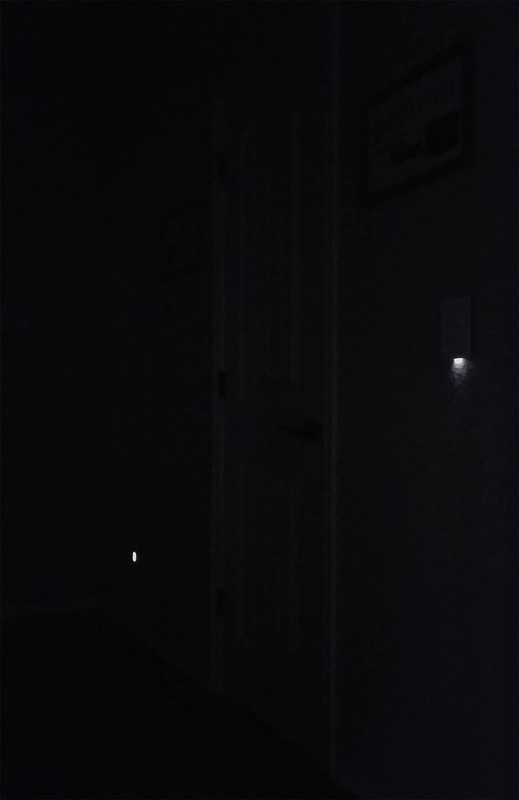 Second, I can tap the light and it literally pops out of the wall and becomes a small flashlight! When you live in tornado alley, you have to be ready to move quickly if sirens wake you up in the middle of the night. It’s not a common occurrence, so it’s not like we sleep with flashlights in our hands. That makes being able to quickly pop out the nightlight between our bedroom and our tornado shelter a very reassuring option. Once we get in the shelter, we have plenty of larger flashlights available. This next section is a little bit more of an investment in installation time and cost, but the end result has been totally worth it for us. 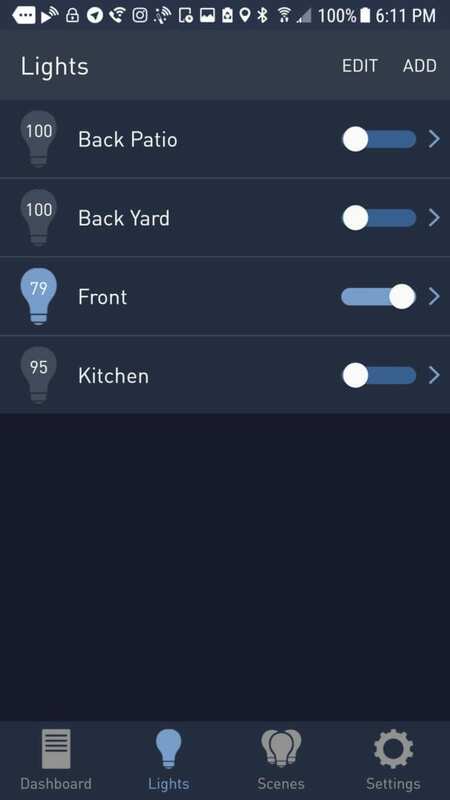 For our exterior lights and kitchen, we added Alexa & phone app controllable switches! 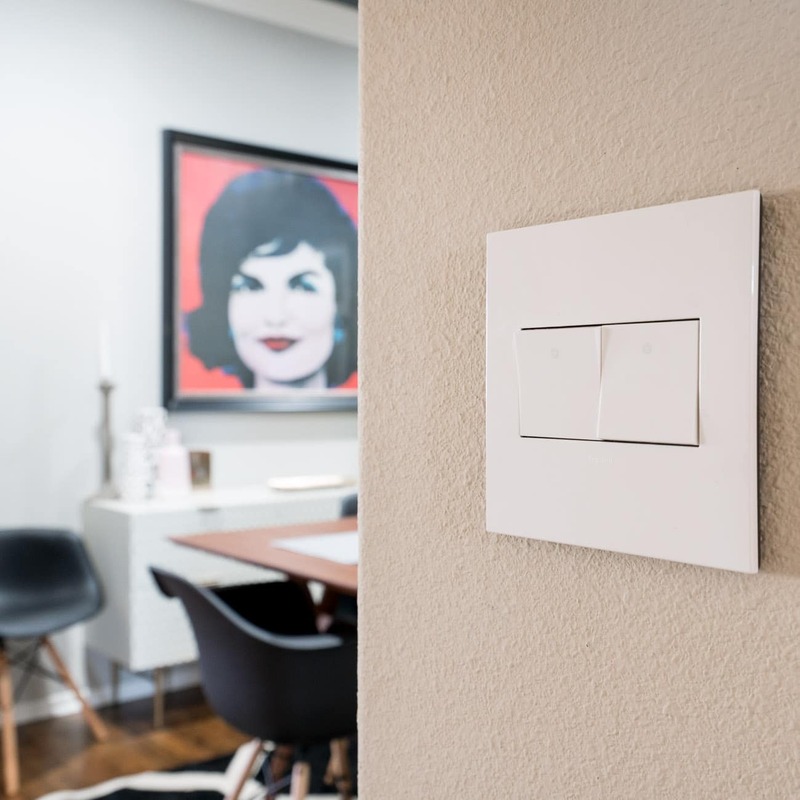 They also work as normal wall dimmers and are just as chic as the others. Now when we’re cooking dinner and realize we forgot to turn on the front lights at dusk, we just tell Alexa and she does it for us. Or if we’re away from the house and it gets dark, we can turn the exterior lights on from our phones. The app is simple, you just slide the “switch” next to the light you want to turn on/off. It seems silly to write, but today it is dark and stormy and I’ve been working at the kitchen island. I didn’t realize how dark it was inside the house until I started making lunch. Instead of stopping what I was doing, switching the light on, and then washing my hands again, I just asked Alexa to turn on the lights without even pausing my lunch prep. The Wi-Fi switches have a few more install steps as you need to tell them all to work together and sync them with the adorne® Hub. Be sure to watch the helpful installation videos for these. 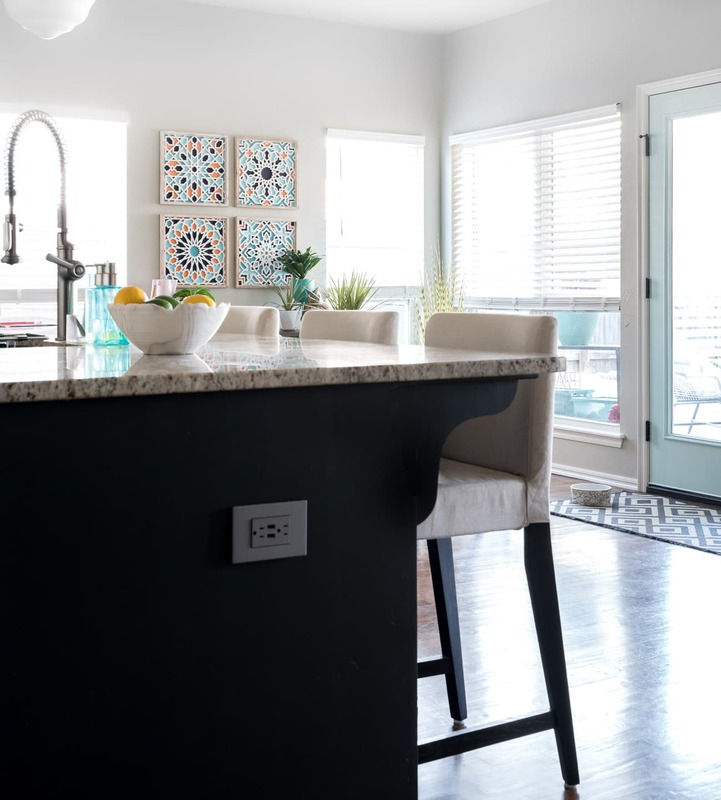 The way the 3-Way (2 switches for one light) Wi-Fi switches install is a bit different than how your existing traditional 3-Way switches are wired, so if you have any trouble be sure to reach out to the Legrand tech support team for assistance. Those are the only ones we needed help with doing a DIY install.We’ve changed out several light fixtures and ceiling fans over the years and know the safety precautions, but are far from experts on wiring and almost all the other switches and outlets still went in easier than I expected. And now that we’ve got the Wi-Fi switches installed, I’d 100% do it again. They truly have added function AND style to our daily life. We’re grateful to Legrand for sharing this awesome product with us so we could test them out for you! And now I’m headed to Lowes to finish the rest of the switches and outlets downstairs. I’m hooked! 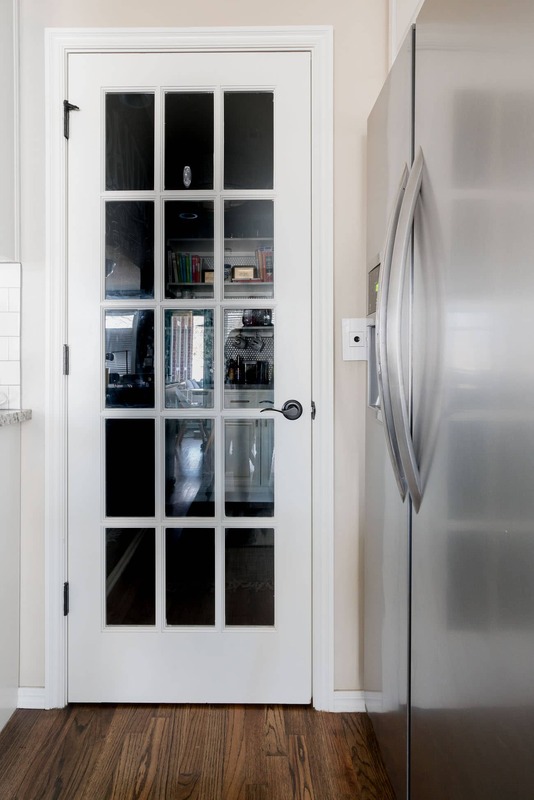 Not only is that so innovative and convenient but it’s amazing how just those little details can make your home look so much more modern! I gotta look into this! I’ve been lusting after these switches and outlets! Your post is going to be my social proof to my husband. Thanks for sharing! Yay! Glad I could help! My husband was a bit skeptical at first too, but he loves them as much as I do.